Round 4 of the Bridgestone Championship at Warmington Lane with track perfectly prepared and an unknown track to most people made for very exciting meeting, unfortunately late afternoon the weather took a change for the worst going into the third block after the Novice/Vets race the meeting had to be abandoned, with weather forecast good for the next day and water draining from the track very well, we were hoping to continue with the meeting on the Sunday, but again with rain coming down during the night and also again on Sunday morning we had no other option but to cancel for safety reasons. Results of the races that took place will stand and hopefully we will have a good meeting at Pontrilas in four weeks time for the 5th round. First to take to the track was the Vets/Novice class this was the only class that managed to get three race before the rain came. 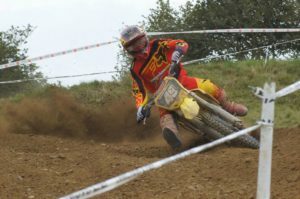 Novice rider Neil Davies took the overall from Red Plate rider Jack Smith with a win in the first race and two seconds. Red plate rider Jack Smith taking two wins and a fourth to take second spot from wild card rider Rob Shem, Ben Gardner and Jake Nicholls completing the top five positions. Vets was dominated by red plate holder Simon Bracey taking all three wins, and only five points separating the next three positions with Jason Gillett taking second from John Gauntlett and wild card rider Gary Mason Third and fourth respectfully, with Gary Jones completing the top five positions. With their third race red flagged for safety reason saw Zac Stealey and Bridgstone mounted rider Harry Linton finish on joint point with both having a win and a second, top spot went to Zac Stealey with a win in the second race, Darren Webster and Jake Ford also finishing on joint point it came down to the second race for positions and Webster took the position from Ford with Ben Bird completing the fifth position. This was dominated by fast gating Chris Grindle taking top spot from Alan Pearce, Pearce taking second and third from Andy Fitzgerald, Nathan Bache taking fourth and completing top five was Lee Powell. With auto taking to this very demanding track this saw Freddie Bartlett taking two wins from Red plate rider Shaun Mahoney taking two seconds, Freddie Gardner taking third from Wild card entry Danny Webster taking fourth and Kieran Paget fifth with only two points separating fourth and fifth made some very close racing. Some great riding from these little pilots with some demanding conditions. Constant battling between the top two riders in the class both ending on the same points which saw Keelan Hope take the top spot from Red Plate holder Tyler Smith having to settle for second, close behind taking third Tom Goodfellow from Ben Humphries taking fourth with consistent riding from Jack Viner taking fifth. Some brilliant racing in this class with first and second finishing on joint points 1st place eventually went to wild card rider Ollie Davidson taking the final moto win from Red Plate holder Ben Watkins, consistent riding from Ethan Sills taking the third spot from Harrison McCann and Charlie Griffiths taking 5th place. Exciting racing in this group between Wild Card Joel Rizzi and Red Plate holder Callum Beeken, close on Beekens tail was Billy Jones bring home two thirds from Marshall Smith who was on joint points with Thomas Casbeard fourth and fifth respectfully. With two straight win Owen Woodhouse who is leading the 125cc championship, from Jack Samuel who finished on joint points with Dean Palmer but Samuels higher place in the final moto gave him the second spot from Palmer, Wild card Jamie Needham taking the fourth from Ryan Manley. Wild Card Rider Deon Thomas and second place rider Brooklyn Evans, with a win each and a third place each finished on joint points with Thomas finishing in top spot, from Evans, with John Mckenzie finishing third Ieuan Harris fourth and rounding of the top 5 Joe Roberts. Well the sun made his appearance again for the third round of the Bridgestone BSMA Championship at a very well prepared Fatcats Motor Parc Doncaster, with most classes full made very exciting close racing in all groups on this very demanding sand track. First to the line where our little pilots with two riders Shaun Mahoney and Freddie Bartlett just back from injured battling hard throughout the weekend, Shaun came out on top with three race wins second and a third again Freddie’s two wins and three thirds with only 6 points separating the two, third spot was taken by wild card rider Archie Girdham, Zane Stephens and Harvey Jackson completing the top five positions. Next to take to the line were the juniors with wild card rider Tyla Hooley taking five straight wins, there was some battles for the next four place between Ellis Poole, Mckenzie Marshall, Lewis Roden and Ben Humphries with only 21 point separating 2nd from fifth gave excellent riding from the young lads and lasses. Keelan Hope passed red plate holder with two seconds a sixth but with two DNF meant that he was out of the top five for the first time during this series. Small wheel 85cc class was dominated between two wild card entries Local Lad Ben Clark taking the overall win, from Toby Potter, with Red plate holder Ben Watkins never far from them made close racing, Trystan Williams taking 4th place, from Irelands Luke Mcshane taking fifth, with only five points separating the next 5 riders . Big Wheel 85cc with only two points separating the top two rider who dominated this class throughout the weekend from start to finish, made for some exciting nail biting racing, Callum Beeken coming out on top , from Bridgestone mounted rider James Hanscomb dropping points in race two, with Marshall Smith riding consistent throughout the weekend taking third from James Hyett, just back from injury Aaron Patstone only two points behind Hyett. Senior 125cc – went to wild card local lad Denny Rapson taking the overall win from Owen Woodhouse, who took the last moto win from Alex Needham with Rapson taking third, which made Rapson, Woodhouse Alex Needham taking first, second and Third respectfully, Jamie Needham taking 4th with consistent riding from Ryan Manley taking 5th spot. Red plate holder Sam Beresford having bad luck in race one with bike problems made him a DNF then had to play catch up all weekend and finished in 10th place. Senior Open – this was dominated mainly by wild card entries saw Joe Cadwallander take the overall win from fast gating Corey Coombes, another wild card in third and fourth in Jamie Osbourne and another local lad Connor Fish, with Brooklyn Evans taking 5th Place. A win for Adam Hill in moto 3 saw Hill one point off top five position. Next to the line was the big boys AMX/Open – The wins were share in the AMX class between fast gating Lee Truman and Bridgestone mounted Harry Linton, Truman with three wins under his belt on Saturday and two seconds on Sunday saw him take the overall by 16 points, from Bridgestone’s Harry Linton who had a fall in race two taking 2nd, and six points behind taking third spot is Darren Webster with consistent riding three fourth place on Saturday and two thirds on Sunday. In part one of Bridgestone’s BSMA rider features, attentions are turned to a budding eight year-old from Worcester, who might have only been riding a bike for a year, but is making rapid progress in the Autos. If attitude and riding style guarantees success, then eight year-old Kurt Evans is destined for great things in the world of motocross. 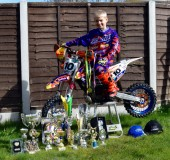 The Worcester youngster has only been riding a bike for 12 months, but his technique already bears a slight resemblance to Belgium’s Stefan Everts, while his determination is equally impressive. A broken clutch put paid to Kurt’s chances in the opening Autoclass race of the Bridgestone BSMA Nationals, only for a faulty replacement to impede him thereafter, but such adversity was never going to get him down. The Severn Valley and Cotswold Youth member has been training hard for what he hopes is a breakthrough year in the Bridgestone Autos series and nobody should be surprised if he impresses at Wroxton for the next round on April 16 and 17. Mark added: “Kurt is training hard. He is already lapping close to podium pace, but you never know if that can be transferred into race day. A revamped Highley was the venue for Warley Wasps meeting. The track was prepared and watered to perfection and with new sections added a great day was in store for all groups. With the auto group growing and having the biggest turnout for years the future stars were ready to go. These lads were terrific, negotiating a technical track very well. Casey Jones won with McKenzie Marshall and Neo McCartney second and third. Rider of the day went to Ashton Phillips with Casey Jones taking home the hole shot prize. Rounding up the top 5 was Kayne Lawlor a Wasps regular and Ben Casey who rode great all day. The lads were cheered, by the parents, at the end of day presentation and every lad went home smiling. Juniors was won comfortably with Matt Tolley taking all three wins followed by Tyler Smith and Joe Brookes. BW85 the Woodhouse boys were first and Second again with Frazer Edmondson coming in third. Seniors James Angel took the overall with the wasps duo of Jordan Riley and Nathan Bache in second and third. Vets EVO great to see Justin Senter back on form. His older brother won the first race but was going to have to play second fiddle on the day after stalling his four banger when under pressure. Richard Chinn fresh from his second at Hawkstone could not find enough for the determined Justin Senter. Auto 1st – Casey Jones, McKenzie Marshall, Neo McCartney, Kayne Lawlor, Ben Casey. The second round of the BSMA Bridgestone Clubman’s Series was hosted by Severn Valley at the demanding Brookthorpe track, which provided some very spectacular racing. The programme started with the AMX with the 2 Bridgerstone riders finishing 1st and 2nd overall. Rob Yates on his Yamaha worked hard to gain a superb maximum from his Honda mounted team mate Jack Timms, who was usually first out of the gate but determined riding from Yates saw him take a closely fought top spot with Timms consistently 2nd. Lee Truman and Dan Wheeler were close all weekend in 3rd and 4th, with Andy Fitzgerald back after injury getting the better of Darren Webster to complete the top 6. AMX OPEN was dominated by Elliott Barrs who took maximum points from Jonathan Roderick Evans always mixing it up front with 4 2nd positions. Jordan Barrs and Shaun Buchan battled all weekend with last race decider with Jordan taking 3rd just 2 points in front of Shaun, 5th place Tim Truman looked set to be on the podium starting quick in every race finishing with 3 top 3 positions but a disaster in the final moto blowing his chances. Aled Evans edging out Ryan Bawn by 1 point for 6th. Senior were next to the line with Alex Walton working hard to get to the front had 3 wins and two seconds finishing well clear in 1st, Oliver Consterdine winning the final race to secure 2nd from Deon Thomas, his win in race 3 enough for a 1 point advantage over Brooklyn Evans in 4th, Nathan Bache riding consistently was 5th with Rory Jones 6th . Senior Open saw Harry Linton take an impressive maximum, last out of the gate in every race Jordan Riley made no mistakes to finish a clear 2nd with John Collins runner up in his last two outings was safe in 3rd despite crashing out in race 3, just 6 points separated the next 4 riders with Ieuan Harris taking 4th closely followed by Jack Biddle, Zac Watkins and Jordan Wright. A full line up of Novices saw Tom Smith never lower than 3rd with a 1st race victory take the 1st position Joe Wilkins with 4 excellent results took 2nd, Ben Gardner completing the top 3. Dan Merrills, Nico Cook and Chris Power all having good results finishing 4th ,5th and 6th. Jack Phelps only riding day 1 took 2 superb wins as did George Pointing who took maximum points on Sunday. Vets: Adam Williams took maximum points from Jordan Cruttenden with 5 3rd positions in 2nd just 2 points in front of Kevin Brotherton, his 2 second spots not enough. Mick Beard , Neil Trigg and Andrew Evans, 2nd overall after day 1 did not ride day 2 completed the top 6. Dave Cooper with an opening 3rd finished his weekend in style with 4 race wins to come out on top, Lee Hartill with 4 2nd spots and a 3rd was runner up well clear of Colin Yeend. Big Wheel 85 was probably the most competitive group with forty riders battling throughout the weekend. Dominic Lancett showed his class gaining a superb maximum but had to work hard to get to the front in some races but once in front looked very smooth with no mistakes. Aaron Colley with consistent riding finished a clear 2nd from Jaydn Murphy riding on the limit, picking himself off the floor a few times to take 3rd. Dean Palmer finished a good 4th from front runner Owen Woodhouse with 2 superb runner up positions in the 2 openers, crashing out and recovering to a good 5th in the next, still looked a podium contender, but a disaster in the last heat crashing at high speed remounted to gain enough points for 5th. 6th place went to Sam Beresford after a disastrous race 1 he recovered well with me strong 3rd positions, for 6th position, one point in front of Billy Jones, Callum Beeken was always going to be in the mix leading the opener but a heavy crash in race 2 ended his aspirations. Small Wheel 85 ace James Smith took maximum points, quick out of the gate and rarely challenged. Billy Duke up from the juniors had 2 superb runner up spots especially race 5 which decided the overall position, with Toby Potter equal on points in 3rd. Ben Watkins came home 4th with consistent riding but he nearly gave it away in the final race to Aaron Patstone who stepped up his pace on day 2 with 2 third positions with Callum Baldwin taking 6th. Another maximum went to junior pilot Charlie Palmer with Bridgestone Sponsored Morgan Evans always in close contention 2nd just 2 points in front of Brad Timmis, who was never out of top 3, Tomas Wright, Lewis Roden and Jak Taylor all having good races, finishing in 4th,5th and 6th respectively. McKenzie Marshall stamped his authority on the autos with 4 superb wins but a blip in race 4 nearly cost him the overall. He recovered well to take the final race and 1st overall by just 2 points from Ellis Poole. The last race was so competitive with Poole closing down Marshall on the last lap. A frantic pass by Poole as he dived down the finishing hill put him the wrong side of the track and he bailed out giving the race and overall to Marshall. Ben Mustoe with a super series results never lower than 3rd finished just 2 points adrift to take the final podium position. Luka Aston was 4th one point in front Preston Lewis, with Dylan Meaney, just one point adrift in 6th, everything depended on the final race. Many thanks to our main sponsor Bridgestone and Severn Valley Committee and especially the first and cover second to none, resulting in a very enjoyable weekend. The BSMA Bridgestone Clubman’s Series round 1 was held at Pontrilas Moto Parc. This superbly prepared venue, with perfect weather and an entry of over 250 riders, set the scene for an exciting 2 days racing. High profile bling of banners, gazebos and a display area managed by our sponsors, Bridgestone, added to expectations of a great opening round. Many thanks to WEM Club for hosting this event. Unfortunately, military activity in the area, adversely affected our electronics system, with the results having to be recorded manually. With such a large number of late entries and duplicated numbers, it proved extremely difficult for the lapscorers, causing a delay in the results. Thanks to Justin Morris who supplied us with a brand new set of electronics to help the BSMA, but sadly the situation could not be resolved. The racing was fantastic with riders moving up to new groups, showing their continued development in the sport. The highlight of the week-end was the Bridgestone Invitation Race, proving to be very competitive for the spectators to watch. The dominance of one make of machinery was not obvious. There was an air of excitement, and as the gates dropped it was Tim Truman with his Husqvarna, who had fitted a new pair of Bridgestone tyres, proving to be a good investment, as he powered to the first corner to win the holeshot prize. He was closely followed by Yamaha mounted Robert Yate and Jack Timms aboard his Honda, both Bridgestone sponsored riders. These three setting a fantastic pace, as Yates took the lead hotly persued by Timms, but despite his efforts lap after lap, he could not get close enough to pass the super smooth Yates. Third place went to KTM pilot Dan Wheeler, who was probably the quickest rider on the track as he closed in on the leaders with Kawasaki mounted Adam Cook, a good 4th, getting the better of Scott Williams, Honda and the holeshot ace Tim Truman. Automatics was dominated by Ben Mustoe, with a maximum leading every race from gate to flag, but Levi Davies keeping him on his toes less than a second behind at the finish of race 1. A mistake in race 2 , cost him a position to finish 3rd. He completed the week-end with 2 runner up positions, to finish second overall, with Luka Aston clear in third. Jayden Lee Davies, Preston Lewis and Dylan Meaney completing the top six. Junior Charlie Palmer carrying on from last year scored maximum points. Morgan Evans, another Bridgestone rider, one to watch, finishing 2nd with Ethan Sills just getting the better of Matt Tolley, followed home by Jak Taylor and Connor Down. Unlucky Ben Pratt with two runner up spots on day one, had no further results on day two. Next to line up were the small wheel 85cc with the opening race going to Aaron Patstone with James Hyett a good 2nd. Hyett running away with race 2 with Jacob Russell in 2nd and Patstone down in 6th. Race 3 was another win for Hyett, followed home this time by Ben Watkins making amense for a crash in race 1. This was enough to give Hyett overall first followed by Patstone with Jacob Russell just 2 points behind in 3rd. Watkins finished 4th with Billy Duke just up from the Juniors in 5th. Despite a bad last race, Callum Baldwin placed 6th. A final mid pack result costing him dear. One to watch this year is James Smith who despite a DNF in race 1 recovered well with 2 top four positions and a final heat win. Big Wheel 85 cc racing really hotting up this year with some new faces in the group. Dominic Lancett with 2 wins and 2 seconds had to get the better of Owen Woodhouse whose first race win made him look favourite overall. A disaster in race 2 saw him finish 4th. Lancett took the win in race 3 with Woodhouse in close attendance. The positions were reversed in the final encounter, giving the overall to Lancett with Woodhouse 2nd. Last place on the podium went to Callum Beeken with a last race decider giving him the nod from Jayden Murphy. Despite a 2nd in race 1 Jayden finished in 4th. These were well clear of Aaron Colley and Luke Woodhouse who finished 5th & 6th. Senior 250cc riders were next to the line, with Harry Linton well clear on points in 1st, despite a 2nd in race 1, to Corey Coombes. He followed up with 2 wins, crashing whilst in the lead in the final race, he recovered to finish an incredible 3rd. Jordan Riley took 2nd overall looking safe until he also had a disaster in the final moto just 3 points separating the next three riders were Jack Biddle 3rd, Mikey Watson 4th and John Collins, the winner of race 4, just behind in 5th. Consistent riding by Ieuan Harris completed the top six. Unlucky not to be on the podium, was Corey Coombes with a DNF in race 2 despite three top 2 finishes. 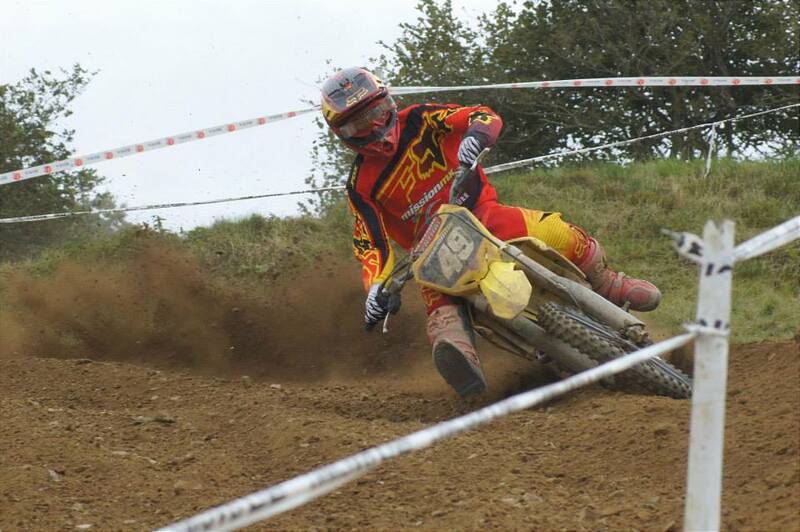 Alex Walton mixing well with the 250F riders dominated his class on his 125 cc scoring maximum points. Brooklyn Evans in 2nd spot had to battle hard all week end with Oliver Consterdine. Rory Jones scored good points to finish 4th from Jake Waterworth in 5th and despite bike problems on day one, Nathan Bache showed his true form with a 2nd and 3rd on day two to finish 6th. AMX action saw Bridgestone riders Rob Yates and Jack Timms battling all weekend with a maximum going to Yates with Timms consistently 2nd. Dan Wheeler finished his weekend on a high with three 3rd places, well clear of Lee Truman and Leon Davies and Ryan Bawn. Open AMX saw Adam Cook back after injury on his Kawasaki took three superb wins to take 1st overall. Not starting the best he finished strong in every race. Tim Truman race 2 winner was enough to give him 2nd on the weekend finishing equal on points with Scott Williams, who improved over the weekend with two runner up spots in his last two races. Shaun Buchan, Kevin Curtin and Mitchell Griffin completed the top 6. A full line up of enthusiastic riders in the novice group saw three different race winners Henry Partridge with just one win, took 1st place never out of the top three. He was well clear of Ben Gardner 2nd with Jack Robbins in 3rd. Nico Cook finished 4th one point ahead of Jack Doran with Dan Merrills 6th. Thomas Smith maximum points on day one, did not ride on day two and Lewis Marshall racing on day two only took the final heat of the weekend. Vets Niki Colclough in 1st place had a good weekend with two wins and two 2nd place results. Consistent riding by Mike Allport in 2nd who was never out of the top three followed by Jamie Askew in 3rd, Richard Evans only riding the 2nd day really impressed with two race wins. Vets Open Andy Watkins showed his class by winning the two opening races. The challenge was taken up by Matt Evans who finished his weekend with two wins on day two to take spot on the podium. Equal on points just behind were John Gauntlett and Gavin Young. Thanks to the WEM Club, Pete Crump and his Team for putting on such a successful event. The paramedics for their superb cover and to our main sponsors Bridgestone. See you all at the next round at Brookthorpe 25th & 26th April hosted by Severn Valley. The BSMA Champion Of Champion End of Season meeting was held at Hawk stone Park on a superbly prepared track, in perfect weather conditions. Five blocks of racing complete by 2.30pm on Sunday . Racing started with the Juniors, despite being the smallest group they coped well with this difficult track. Charlie Palmer was in a class of his own improving his race times throughout the weekend. Never under any pressure he finished with a faultless maximum. The real battle was for second place with Ben Pratt looking set to take that position but a couple of costly mistakes let Matt Trolley with consistent riding take runner up from Ben in third, Jak Taylor improving all weekend deserved 4th with Josh Noon in 5th, one point ahead of Connor Downes in 6th. A full line up of SW85’s made for some of the most competitive racing this season with 3 different race winners. Adam Collins gaining top spot but having to work really hard as Kacey Hird showing quick times around the track made some mistakes allowing Adam to gain a few unexpected results. His charge to the line in race 4 looked so unlikely to take the win from Dutch rider Ryan Debeers but his determination got first place which only the electronic timing could decide by less than a tenth of a second. The final moto saw a gate to flag win for Ryan Debeer but once again he was pushed all the way to the line by Kacey Hird. These 3 riders were kept on their toes by 4th place Dominic Lancett who had a couple of top 3 finishes who also had to fend off challenges of James Hanscombe, Callum Beeken and Joel Rizzi. Big Wheel 85 were next on the track with Callum Gasson scoring maximum points in this group. He was challenged in every race by Oliver Consterdine and Jack Bintcliffe who finished 2nd and 3rd respectively. These 3 were well clear of the chasing pack with just 2 points separating the next 3 riders Alex Needham was 4th with Jamie Needham and Joe Davies equal on points in 5th and 6th. Senior racing was dominiated by maximum man Conrad Mews, the next 9 places were always in doubt but it was Dexter Douglas who took 2nd overall clear on points of the rest of the group Alex Walton took the final podium spot finishing strong on day 2. Kieran Cooke recently back from injury could never be written off as he battled his way through the pack to gain vital points James McFadden had mixed fortunes with impressive races and spectacular crashes. George Fountain started the weekend with a good 2nd spot but was unable to continue his good form and a bad result in race 4 relegated him to 6th. 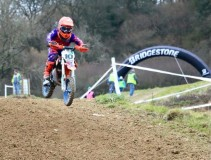 Will Hughes with a 2nd and 2 thirds looked to be in contention but a DNF in race 4 spoilt an excellent weekends racing. Another maximum went to Matthew Callaghan in the AMX group he was never headed but was put under content pressure by Henry Williams who had to fight off the hard charging Bridgestone Mounted Rob Yates who worked hard aboard his 125cc coming from behind to gain a creditable 3rd. Jake Ford, Kyle Lane and Lee Truman completing the top 6. Open class victor was James Chadwick his maximum being spoilt in race 1 by Ray Rowson who took no further part in the meeting, Gareth Artus and Mitchell Griffin completing the podium positions. Nick Cook, Max Pinney and Frazier Gardner finished 4th,5th,6th respectively. Fabio Rizzi came out on top of the Novice group with 4 wins, he was well clear on points of Luke Pincher and Sean Wilkingson in 2nd and 3rd. Adrian Latham , Josh Boseley and Lee White completing the top 6. Vets was won by Tony Houseman who improved as the weekend progressed with some good wins. Richard Evans with consistant top 3 positions was 2nd with Greg OCallaghan 3rd. Steve May was 4th 2 points ahead of Simon Clutton in 5th with Richie Frankcom winner of races in day 1 could not maintain his form on day 2 in 6th. The BSMA Management would like to thank all the clubs whose expertise made this meeting run so well and to the Hawkstone Management team for their invaluable help and assistance. Bridgestone BSMA Clubman’s Championship final round at Penybont , all 30 races completed in good weather throughout the series, it was all down to the clubs giving 100% and helping each other to promote the events. With costs kept to a minimum with concentration of venues and travel cost lower than previous events, the outcome was in doubt until the final round with results changing on this challenging track. Junior Charlie Palmer came to round 6 looking to be favourite. But a super weekend by Billy Duke who got it all together to take top spot from Palmer, who’s mistakes cost him the title, and with the efforts of Tomas Wright and Trystan Williams stopping it being a two way contest, Billy Simpson who was consistent all year took third overall. SW85 Dominic Lancett finish well Clear on points despite having to pass the fast gating James Hanscombe all season but always looking to be on the podium was a battling Jaydon Murphy usually in the top 3, James Smith one to watch in the future in 4th. Big Wheel Champion Brooklyn Evans had serious challenge throughout the year from Jordan Riley having bike problems but giving 110% a force to be reckoned with was deserved runner up, with Nathan Bache finishing the year strong, despite mechanical gremlins. AMX saw Karl Haycock having great final round from really improved riders Chris Grindle and Lee Truman. Bridgestone mounted Rob Yates and Jack Timms despite missing a round added to the excitment in this very competative group. Vets saw Fred Smith become 125cc champion. BSMA WOULD LIKE TO THANK BRIDGESTONE FOR THE SPONSORSHIP AND HELP THROUGH OUT THE SERIES. THEY WOULD ALSO LIKE TO THANK RACESPEC FOR THERE GENEROUS DONATIONS.